Superstretch and Microwoman were the code names of the crime-fighting suburban couple, Chris and Christy Cross. They wore coordinated jumpsuits without masks. Chris could shape change like Plastic Man and Christy could shrink to microscopic size. Together with their dog named Trouble, they had lightweight adventures with a bit of comedy mixed in. Their show was part of a cartoon block called Tarzan and the Super Seven. The show ran for one season in 1979 and there were only about eleven episodes. 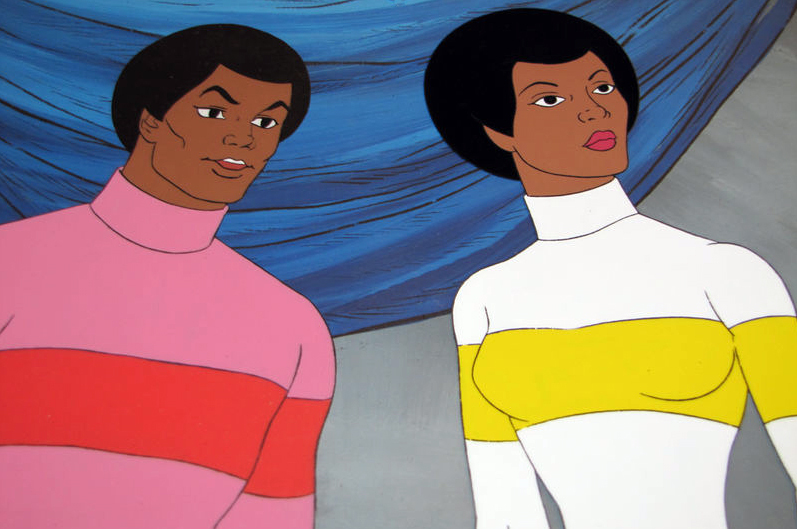 While it was not so uncommon for there to be Black characters on Saturday Morning TV, it was noteworthy that they were able to headline their own show and as a married couple no less. A few observations: Superstretch was pretty versatile. Microwoman, while easily the more sensible one, only had the power to shrink. She often rode on the back of their dog, Trouble, to get around. One thing I did like is that their being Black wasn’t a gimmick. They were Black and that was it. The color of their skin was never discussed or made an issue on the show.